You may have noticed that waiting times for a driving test have gone up recently in some areas. We’re working hard to bring waiting times down in those areas. Here’s what we’re doing about it. I want to apologise for the inconvenience increased waiting times cause. I know how important it is to be able to get a driving test within a reasonable amount of time. 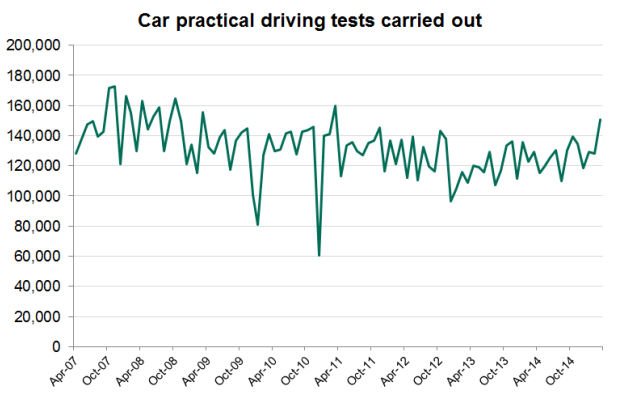 We carried out 407,000 car driving tests between January and March 2015. That’s up 5.2% on the same period last year and demand is increasing. Find out more in the ‘Driver and rider test and instructor statistics: January to March 2015’. For the last couple of years demand has been fairly static, but late last year as part of our forecasting for our yearly business plan we predicted an increase in demand for driving tests. We also knew that an increasing number of our examiners were at or approaching retirement. So, we started a nationwide search for new driving examiners in October 2014. As you can imagine however, this is a lengthy process and not always a successful one. So, we ran another campaign in March and are currently running another with a further one planned for October. Who’d want to be a driving examiner? Over 2,500 people, it turns out. That’s how many applied for the jobs we’ve advertised in the last 12 months. The applicants must get through the stages below before they become an examiner. You can find out more about how it works in our guide to becoming a driving examiner. The recruitment process is somewhat lengthy. But that's because finding the right people takes time. Not everyone who applies is right for the job. It's important that we assess candidates thoroughly and give them the right training. This lasts from 5 to 7 weeks, and can be quite intense. Staying away from home for weeks at a time can be hard. We know that this has put some people off applying in the past, so we’ve changed how it works. It means people now spend less time away from home and it’s helped us to attract wider range of applicants. Some of you may have already seen some new faces around your local test centre. If you haven’t yet, I’m sure you will soon. Since April, 66 new examiners have started at test centres across Great Britain. We have also offered a further 89 people posts and they are currently on the new entrant training course or waiting to attend it. I hope that, once in post, these new examiners will help us continue to reduce waiting times. We aim to offer tests within 6 weeks by early next year. Good to see some action is being taken regarding waiting times. I did write in and receive a reply, however, in Bletchley Milton Keynes we have an 17/18 week waiting time which means a pupils can't even make a booking and get a date. As a result of this their are some very frustrated pupils out their. Is it a case of to little to late. In our area the number of examiners has dropped considerably, and demand apparently has risen which I think we are all aware of. Short term what is the answer for this year? I am sure over the next 3/4 months the waiting list will be sorted. So the waiting list in my local test center says 12 weeks I had a look for a pupil yesterday and it's 17 weeks. This is far beyond the 6 week maximum wait the government set out It's making my job so stressful trying to guess so far in advance and I really can't see it get any better soon. After 19 years this is by far the most frustrating time. I hope so Tony, as in the area we have many pupils that go on line and can't even get a date. As a result many instructors are telling me they have pupils who are just simply stopping lessons. Then next thing is they will fine a short notice test, and not be ready for it. In our area lots of instructors I speak to including myself are getting calls such as can you take me for my test in 1-2-3-4 days etc. I personally never do as I don't have the time and I would always want to asses them. But difficult times. And clearly some shortfalls in planning somewhere along the line. The driving test waiting list is abysmal....and has been for OVER 12 months....what a disaster !!! Well I did and was one who applied to be an examiner in my area Bletchley, Milton Keynes, but yet again I was turned down for the 4th and final time. I will not be applying again for this position if it came up again it is just not worth the effort, time, and rejections. I am a solo instructor in Milton keynes and very successful one at that with my driving school and yes the waiting time is starting to get annoying to my pupils who are ready but can't even book one. I do hope you sort this mess out sooner rather than later 18 weeks and not even able to book a test is not acceptable. Tony, if they were getting it right then the waiting times would not be this high would they as we see people come and go all the time. Lets fingers crossed this gets fixed and when I see the comment above saying we are aiming to get tests waiting times down to 6 weeks by early NEXT YEAR.............wow. Please please please get these times down. I sympathise with experienced driving instructors being turned for a position as an examiner. I have applied twice at my local test centre which has rarely offered a wait of less than 12 weeks for a test and has been offering tests after a wait of 16 weeks. I have never been offered a face to face interview instead I have been subjected to a fairly standard online business questionnaire not focused on people skills at all and certainly no mention of the driving based industry your applying for. I personally have many more skills than would be necessary to become a driving examiner and do not necessarily want or need to work full time so why are people in my position not considered as a flexible way to suppliment a full time test centre staff where if busy they could work a little extra if necessary. Our local centre bring examiners up from Wales to Bucks regularly paying travelling and accommodation expenses. I feel if the DVSA were a private business it would be run much more efficiently than at present with a typical NHS approach to employing expensive temporary fixs to long standing problems. Sorry to hear that Brian. And they give no reason? Bletchley I'm told would like 10 examiners and we have maybe 3/4 at the moment. So if they are turning you away, we ask is that the case with others!! Carl, each time we run a campaign we receive hundreds of applications, so like a lot of organisations, we use the Situational Judgement Test as a way of sifting the number of applications down to a reasonable number to interview. These wating times are a joke. When I took my test the wait was 4 weeks back in the 1980's why is it so long now? To top it all my poor young lad has today turned up for his test after wating 3 months already for it only to have it cancelled due to strike action by the examiners. He's gutted. He is trying to get an apprenticeship but needs his own transport to be able to get there and to the training providers. Extortionate bus fares and ridiculous bus journeys are not an option out here in the sticks. We desperately do not want him to buy a motorbike, especially since it would mean him having being a learner in the winter months on un-lit country roads - so treacherous. God forbid if he were to have an accident. The truth is though that he will probably have to get a bike as he's been shoved all the way to the back of the queue now - early Feb 2016!! It seems totally unfair. Not and act of God, not his fault; so why treat him like this? Why in such cases are the DSA not going to contact people like my son to offer them cancellations? They should be getting first refusal surely in this situation? How can anyone justify pushing them to the back of the queue - he will have waited 5 MONTHS for a test!! This cannot be good for the economy. My son has exactly the same situation. The test was booked 12 weeks ago for the 14/12/15. Received email today saying test cancelled due to examiner no longer being available!? New test date......Feb 2016. I'm so cross at the lack of any explanation (I know I'm not owed one but I d like to know why there is now no longer anybody available) and I'm so disappointed for my son, he's waited a long time and has been so excited. I too think that he should be offered any cancellations that come up. February is not, (in my opinion) a good enough alternative test time. M y son has also experienced problems with his test. Booked for 25th November then on day was cancelled due to examiners' strike action, New date given for 25th January. This was cancelled on the 22nd January by e-mail, no examiner available. New date 16th February. This has gone on for months and his job contract cannot be made permanent until he passes his test. Understand there have been over 30,000 test cancellations in the last three months! Disgusting. I can't even get a test date! They clearly not listening to the people but busy cashing in. If the situation is bad for cars it's not a patch on the HGV/PSV/B+E testing. DVSA are closing test centres as if its going out of fashion. A huge swage of the midlands is without a test centre within easy reach Major cities and towns - Derby, Stoke, Stafford were left without a test centre less than 2 hours drive away, when Swynnerton was closed and now Wrexham, following on from Liverpool, is to be closed. And all you offer us is 'Could you hosts tests at you're site?' and 'we're hitting our target to reduce the government's land holding'. Many HGV/PSV and B+E instructors are small businesses and having to supply a 66m x 11m (that's larger than an olympic swimming pool) manoeuvring area to test standards is out of our budgets. It grossly favours the large companies against the smaller ones and throttles competition in the market. With test centres closing on the HGV/PCV side and many local test centres being closed examiners are getting fed up with the lack of local organisation and with test centre managers now looking after 2 or 3 test centres it is likely to get worse. Who suffers the pupils and the driving instructors. Come on DVSA recruit more examiners of the right caliber and make sure you keep the good ones. We must be blessed here on the South coast. I use Hastings Ore test centre. It is also a DVSA (VOSA) testing station. DVSA have closed the nearest B test centre in Hastings and have combined all HGV/B+E/Car/Bike tests all in one place. Initial sharing problems have been overcome and the system works well. Historically it had always been the HGV/PCV/B+E test centre for the last 30 years.. The facilities were a bit grim to say the least, especially if you had female candidates, but with the centre now a multi test centre, the toilets have all been refitted, painted and (wait for it) we have hot water AND hand dryers whoopee!!!! I think the plan is too phase out the DVSA vosa test centre and have it all completely for vehicle learner tests. A few smiles by us HGV trainers when the car tests are just about to go through the exit gates at the start of their tests to be met by a 40 foot artic inbound for their VOSA test needing the whole entrance to get in. The looks on the learners faces are classic what do I do now looks, and the examiner saying 'do you think we should reverse a little'. Makes I larf every time. I can see you HGV trainers smiling now. (Evil)!!! I own a HGV school in Eastbourne East Sussex, so for me Hastings is ideal. Other than that, it's Lancing or Maidstone, both miles away from Eastbourne. Very lucky. Paul, we don’t intend to close any Vocational testing sites without finding an alternative, and over the past few years, we’ve opened 59 customer sites. We’ve also recently opened up a number of Motorcycle Manoeuvring Areas in order to host B+E tests. About year ago I queried with my local senior examiner why tests were no longer available on Saturdays , he told me overtime had been stopped as they were not very busy even though there was a 9 week wait for tests. It seems that the organisation is disorganised and we and our pupils are suffering from them not realising how the impact of emerging from austere times would impact on demand for tests.I always plan ahead why did,nt they. All very well getting to grips with technology introducing tablets on driving tests.How about more investment in training new examiners and re training the ones we have now . Where waiting times are high, we encourage staff to do overtime to help ease the situation. Current demand for tests has significantly increased, so this has had an impact on our service. Our recent recruitment campaigns, plus the forthcoming one in the Autumn will help us to reduce these times. Yes, in addition to our usual campaign, we ran a direct entrant recruitment campaign for both Motorcycle and LGV examiners in April, which was then re-run at the start of July. We should have more details on the outcome of this campaign shortly. This blog is a good idea, The same issue is at Luton where you cannot get dates its iDecember, this is not good customer service with only 3-4 examiners working where it used to be 8-9, not sure what is going on. there is a struggle to get weekend tests also and customers are also not happy, this is having an impact on my work and there are companies out there charging for early dates, Bletchley is also a high wait which is a nearby centre, please advise how this will be resolved ? Regarding adis been turned down for the Exmainers job I have spoken to many who blew out on their own driving which is a bit of a worry. Im in a position where i am ready for my test but i have to wait 5 months in Birmingham. Im really annoyed as i dont want to waste money on 5 months more of lessons. Im considering a test centre in the midlands. Is this a good idea? Ive spent so much money on lessons and dont have a family care to practice in. Hope someone understands! In 30 years of teaching ,I have never known the waiting list for L tests to be so long . DVSA should hang their heads in shame !! Three month waiting list at Widnes Cheshire . Likewise Peter. It's crazy in a bad way. I did an interview yesterday with the Mail on Sunday, who are telling me that will come out tomorrow saying almost exactly what you have just said. I'll I'm trying to do is raise awareness. Outside the Adi who clearly is in the know. Demand for driving tests is increasing and we are working hard to ensure people can take their driving test as quickly as possible. As part of this, we are currently in the process of recruiting more LGV examiners. We apologise for any inconvenience caused by the wait. Test slots will often be available earlier than the official waiting time, as this is calculated when more than 10% of tests are available. Candidates can also check our online booking service on GOV.UK to find short notice cancellations. Bob Southwick- Saturday tests have disappeared in Doncaster since the DVSA stopped paying examiners overtime. I notice the cost of Saturday tests hasn't come down,so how can this be justified. This happens EVERY summer. You should both recognise and proactively plan for it. Students travelling away for Uni aren't getting to sit their Tests! Unfair, mismanaged and a very poor service. The waiting time in Basingstoke is up to 18 weeks. I was asked to book a test for a customer and there were no dates being offered at all. Also the centre has had only one examiner working on some days rather than the 4 examiners that the centre has capacity for. I do hope that this situation improves soon. I'm surprised to see that the starting salary for examiners is so low. I mean no disrespect to those choosing to apply, but given the involved and extended recruitment process, you'd have to start down it for love of the work. Regarding the knowledge of the Highway Code, in my experience learners now download one or more "Apps" and do mock tests perpetually until they feel up to taking a theory test. They do not even look at the free PDF of the Highway Code, let alone buy one despite my thrifty "it's where the questions come from and it's free" advice. Regarding pedestrian crossings, it strikes me that they're on or near junctions because they are simply not used if a few extra steps are needed to reach them. By being aware of this (at any junction - marked crossing or not) we can minimise our "surprise", making progress safe for all. I have recently had two students who both tell the same awful stories about car drivers beeping them, verbal abuse and engine revving for taking extra time to cross. I teach auto and they learned with me because they need either two walking sticks or crutches to get about. So it seems we've still plenty to go at to educate all sides. It would be 'nice' if the DVSA sorted out the amazing lack of Motorcycle Examiners. It remains to be most difficult to obtain a Motorcycle Test (Mod 1 & 2) in the Lancashire and Greater Manchester areas and, I've no doubt - Nation Wide. The removal of so many of their expenses has forced too many respected Bike Examiners to give-up the post and to return to 'car' and 'LGV' Testing. I am very confident that - if not already reached - the DVSA MUST be in contravention of its 'Service Agreement' with the Government to provide Motorcycle Tests / Examiners. What is being done about improving service for Motorcycle Tests? I attended the Cardington Course but after two weeks I felt it was not for me. I would of loved to finish the course but the fact I would have to relinquish my ADI licence on completion was a major factor. Was I prepared to gamble? No. It also hit me that taking seven tests, five days a week was not for me. Where was the job satisfaction? I (as well as others who don't complete the course) therefore compound the problem. Trowbridge and Westbury DTCs which operate 2 days each as week as part of the Taking Testing to the Customer initiative have, since they were opened in late 2011, nearly always had waiting times of over 9 weeks and often around 13 weeks. What did the DVSA do to rectify this? ABSOLUTELY NOTHING! Despite assurances being given by DVSA at the outset that waiting lists would be kept under review and DVSA acknowledging that demand was far higher than expected (and that was during the recession...it's increased since as DVSA admit above), in response to an offer within the last couple of months from the owner of the Westbury venue of an additional day for testing to be undertaken DVSA clearly stated that there wasn't the demand!!! DVSA have even claimed they'd need planning permission to increase testing despite our receiving written confirmation from the council planning department via a councillor that they wouldn't DVSA REFUSE do anything at these DTCs to improve waiting times. Prove what you're saying above DVSA and take up the offer to undertake an additional day at Westbury DTC or put in a third examiner; after all you say you're recruiting more. There has been a totally unacceptable waiting list in Trowbridge and Westbury areas since 2011 and not just recently, Surely this needs urgent rectification and such DTCs require priority action to be taken if anyone is to believe what you're saying above? I agree about having the right staff as this gets the best for DVSA and supports our pupils who take tests as in the olden days examiners were not allowed to talk and people were nervous and did not do well. One of my concerns is the lack of representations in the workforce to represent the community they serve ie customers turning up for tests for example Luton centre must have 80-90% of customers from different backgrounds this include us instructors but the workforce does not represent that. Is this area being looked at by DVSA, do you keep data on the different backgrounds that people do tests from and of course as well as reducing waiting times and getting tests for Luton Bletchley as they are my closest test centers and I am losing work which I cannot afford as a self employed. I agree with the principles but some comment here are very serious as the service is not good and why hasn't DVSA planned for this as you can see people will retire etc and I have applied like others and not got through the system in place doesbthat need to change ? only employ people with the right ability not the colour of their skin or background. Not sure what you mean by area operation manager who is there in this area I have not seen anyone please explain? I have written to mine twice over the last 2 months guess what no reply. It's an interesting read but doesn't cover all the facts. As well as many of the examiners retiring, many examiners have chosen to leave due to increasingly difficult working conditions, including a real-terms pay cut, no longer being paid a overtime for Saturday testing (despite DVSA charging customers more for a Saturday test), unfair sick absence policies for staff, and setting unreasonable targets for staff to achieve. The change in training new examiners is interesting, taking the training to the examiners, rather than forcing them to stay at the training centre for lengthy periods, which could be difficult, particularly for those with caring duties (bordering on discrimination) - long over due I say! It's a shame they have lost some good, younger talent already due to this inflexibility! What isn't mentioned is that a few years back, examiners who used to move between centres (called float examiners) were all sent back to their home centres and had their work filled up (it was a temporary measure to make the waiting times look better at that time). Then, if there was sickness, tests got cancelled as they had very few people on standby to cover, that has never been changed back - hence the high quantity of DVSA-cancelled tests we (ADIs) all suffer with now. I wish the new examiners the best of luck, they work in very difficult conditions and most do a sterling job! Let's hope this drive achieves what it sets out to and my students can get tests in less than 18 weeks! I totally agree that DVSA need to employ right staff and its length process and people are retiring, but every organisation faces these challenges and they manage these changes all the time. Its not rocket science if people are retiring then you need to recruit new ones in good time. People pay good rate for driving test and they need to be served in timely manner instead of making excuses. I need to book a test in Bletchley it is a joke that there are none you need to open up more dates or have some sort of text message that you can sign up to so you know when more dates come on. Please just put more dates on. In support of our much respected Motorcycle Examiners at the Lee On The Solent test centre, I cannot believe that training a new examiner properly is cheaper than providing riding gear for an already experienced one. The DVSA seem to be shooting themselves in the foot for no gain. The bike training schools are bearing the brunt of the problem by not being provided with enough tests to support the higher levels of business this year. Just when we thought that we were recovering nicely with the first decent year since the dubious introduction of the 'stepped' licence system, we get blown out the water with only being given about 30% of our usual number of tests in September. Those, like myself, who have been dealing with the DVSA's inefficiencies for many years, are not surprised at the way this problem has been approached, and the mayhem they have created. On a positive note the DVSA booking and deployment staff deserve a medal for making the best out of a bad situation. I wouldn't want their job. yes the staff are doing a great job under extremely difficult circumstances. Im sorry, but its really not good enough. In the slightest. It forces learners into spending even more on lessons in the meantime else their skills will diminish before the test. Not to mention the increased costs of insuring a vehicle as a learner, which we will have to endure for longer. Draft examiners in, get retired or recently ex staff back in to help. I dont even care if the cost is passed to me at this point. I just want to get on the road quickly and safely. Driving is key to social mobility. The DVSA's ineptitiude, and inability to plan accordlingly; is holding a raft of people back. Dan, we try to anticipate the demand of tests and plan our workforce accordingly, as far as we can. We’ve done this by offering more flexible working to keep existing examiners such as partial retirement and part-time working, as well as offering flexible terms and conditions to new entrants. Phil, it is now six months later, and clearly this strategy has not worked. Waiting times for booking tests, in many areas are many months, which is unacceptably long. So what has the DVSA done to change the situation? And how long has it been predicted for the current appalling waiting time situation be rectified? It would be helpful if the DVSA outlined it's long term plan, with predicted outcomes, accompanied with explanation, to enable us to understand, because at the moment, it appears there is no working long term strategy. My normal test centre is Grantown on Spey. For the last 3 or 4 months the waiting list has been so long that dates are not even being offered. It would be a great help if the ADI’s in this area could in some way register to be advised by text or email when new dates become available. 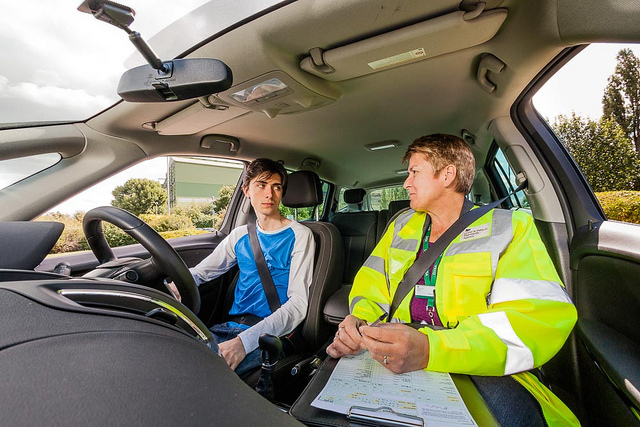 It is very doubtful the dvsa would take on instructors with a long history in driver training, as they would be too difficult to convert to the dvsa agenda. Which is very strange, when you consider we both have the same goal ie. to produce safe pro active drivers. Having been an instructor for 23 yrs, I would say if "Yes" was not your favourite word, you have very little possibility of becoming a driving examiner. Phil, we’re happy to take on anyone who is successful in completing the examiner training. Our training is rigorous enough to ensure that anyone who meets the standard will be offered a DVSA examiner post. We have recently employed a lot of good ex-ADIs who have provided positive feedback of their experience as an examiner. Do the DVSA look at the customers and demographics and also look at ensuring that is representative of the workforce, is that monitored by DVSA as I don't see that around the area I work in which is Bedford, Bletchley and Luton. If you look at the census data that makes it obvious what the population of these towns are and people backgrounds. Surely this should happen just like other organizations such as the Police force who go and hold recruitment campaigns and local evening events seminars as well as online forum chats on skype, what is the DVSA doing about this as the way jobs are advertised is not good it should be in local news papers or seminars in the local community as not everyone would be registered on the government jobs website so they miss the opportunity and this also does not get all the different people from backgrounds. Is DVSA planning to hold local events to publicize vacancies and make people aware of these to get more people from different areas and backgrounds and stuff. Any recruitment that DVSA carries out has to meet the civil service principles of appointment on merit to the civil service made on open and fair competition, with vacancies advertised in full to all. We understand that not everyone is registered on the civil service recruitment gateway but this remains the way to apply for any post within any department across the civil service. Anyone interested in working for the civil service can sign up to the website to see the latest vacancies and get alerts. We do revisit attraction strategies for all campaigns and include local events and/or paid media in certain locations where it’s appropriate. During a campaign, in places where we’ve historically experienced lack of applicants, we’ve placed recruitment information in the local driving test centres and sent out geographically-targeted DVSA direct email alerts. 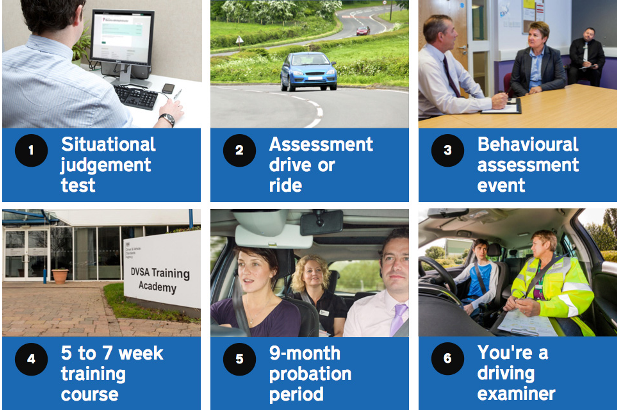 In addition, we created the ‘Become a driving examiner’ guide to explain the role and recruitment process (link: https://www.gov.uk/government/publications/become-a-driving-examiner/become-a-driving-examiner). Thanks for the response, apart from the test centers are you planning to use any other strategies to recruit people from other walks of life would not visit a test centre at local community events / exhibitions / career fares like the police do, they also hold Twitter and Facebook events etc are DVSAplanning things like this so they can attract other audiences etc and this is the modern way and the 21st century. I look forward to your views and strategies on this Phil. I know many instructors that have become examiners that is not a problem. Like you say we have the same goal, I think more of us instructors need to apply, I have applied and it is not as easy as I thought, maybe you should apply and you will realize like it says you have to have the right people and some instructors I see are not right and would be wrong for the job as they are not very professional. I failed my driving test yesterday due to nerves and will now have to wait 13 weeks to try again??? Another 13 weeks of lessons I cannot afford to keep my driving at standard, It is disgraceful!!! DVSA have a lot to answer for!! The situation on LGV/PSV/B+E testing is dire!. DVSA are closing test centres as if its going out of fashion. With the ill thought out closure of test sites in the Midlands. With the recent closure of Stafford and Swinnerton, companies that used these now use Harlescott, Shrewsbury, it is now virtually impossible to get a test there! A truly pathetic situation DSA! My small company has been limited to 1 test booking per week, this is costing us serious money and lost clients! I agree with previous comments, It grossly favours the large companies against the smaller ones and throttles competition in the market. I have now got my MP involved, this is totally unfair to the small business! I have seen a video that DVSA have made for vehicle examiners is there anything like that for driving examiners which tells about the job and what happens as that is a good video which gives an idea what you are getting into. Well, about a month after the DVSA blog above and, quick as a flash, the waiting time at Chippenham is still 10-11 weeks and Trowbridge/Westbury 13-14 weeks. Just let us know once it's sorted DVSA and stop spouting pathetic excuses for your total and utter incompetence. If you were a professional organisation you'd know several years, if not decades, before examiners retired and if you listened to your customers you'd have known at least 2-3 years ago that business was picking up and that there'd be an uptake in demand as the result of more 20 somethings learning to drive. In the professional world it's called market research and taken very seriously. Maybe DVSA could do with some lessons on anticipation and forward planning rather than trying to simply judge whether others are capable of doing it; the words "pot", "calling", "kettle" and "black" come to mind! Hopefully, the government will do as they did in the Republic of Ireland and bring in private sector testing organisations like SGS to sort out DVSA's problems. About time and the competition can only be good for the customer; learner drivers and ADIs alike. Even after the backlog resulting from the DVSA's total lack of business awareness has been sorted, I'm sure there are several areas where the retention of public sector testing organisations alongside public sector ones would be well justified and utilised (Trowbridge / Westbury is one, no doubt along with major cities and other significant towns). Oh, and in case you think I'm sounding angry...THAT'S BECAUSE I AM! The truth is DVSA are a monopoly employer that take unfair advantage of a dedicated examiner workforce. Examiners have recently been manipulated into an unfair pay deal and now overtime and detached duty is far less attractive than it used to be, so no one wants to do it-this will just make the waiting times even higher and morale of the staff even lower. Flat rate overtime (from November), very little incentive for being away from home on detached duty for weeks on end. The issue of the standard of candidate being presented for test is the main reason so many find themselves waiting for another test. Also, renumerate the staff properly for their time and skills and the waiting lists will come down. The waiting time for Luton at this moment is 19 WEEKS! How appalling is that? Yet they still charge £62 to take a test. What is being done to resolve this issue? Probably NOTHING! They've told you what they're doing. They're recruiting more examiners. The problem is here and now. Yes, they should have anticipated retirements and so on, but they didn't. There's nothing that can be done about the past. Yes, it's what they're like. Going on and on about it is the first thing a new ADI learns when they pass Part 3. The second one is the one is the one instructors should be really worried about. That's what the current trials looking at changing the driving test are all about. But ADIs will probably be in heaven over the prospect of increased pass rates (or the fact that they're involved in the trials), and they won't consider the significantly weaker skills that people they helped put on the road will have in the future. I can understand candidates being angry at the long waiting times, but I cannot figure out why ADIs have to add so much fuel to the fire, and loudly shoulder so much of the burden, unless they're becoming too emotionally involved with their clients. If it's [number] of weeks, it's [number] of weeks. Work around it. You can't change it in the here and now. DVSA has openly stated it is too long and it is taking steps to deal with it. fully understand the reason for the tests been cancelled at the last moment but Faisal is doing his very best to fit in the Pdis with little or no effect on the Pdi. factual information from driving instructors . wages or off mum and dad. I am a training PDI and have tried to book my Part 2 Test and been told no dates at all at Bletchley Test Centre from now until March 2016 ive checked every month up till then and get the message showing no dates available. However if I look at Northampton Test Centre I can get a test date any Thursday from now until March 2016 I started my ADI training in May 2015 with the hope of becoming a fully qualified ADI by December 2015 and gave up my full time job in retail in June to concentrate and dedicate more time to training for the career I actually want to do. I have now had to go back to working in retail as there is no point in continuing the training until the DVSA sort out Examiners for Bletchley Test Centre once they have sorted that out I will then resume my training. I am lucky that I have my own car so can practice driving skills without using my training hours up and can keep them for when I get a date booked. I feel for the L drivers who are having to wait so long for a test date and having to spend extra money on lessons to keep up with their skills so they remain ready for their test when they can eventually get a date. Just hope DVSA appoint Examiners in Bletchley soon so this issue is resolved. I am trying to get Bletchley but no tests also what is being done? I have two years to pass my instructor test from the theory but cannot get dates. I like to know what is happening. Is it not possible that your driving instructor take your fair test. People get nervous with examiner. No one is perfect driver, even the examiners. I saw lots of drivers with full driving licence making mistakes. last tuesday, when i was coming back round about was cover with cars LOL. Roundabout don't look round about. Do we have any roundabout rules, i think only for test . I try my best to pass the test :(.. but when i saw drivers who have full licence and their behaviour with pedestrian was not good, i really feel sad..
Will it be not a good idea if students can have more than 20 lessons and mock tests. Their instructors made video with out telling them and on those videos examiners can do the decision. We just need to be patient new examiners are now appearing at test centres. Why cant you just fast track the people who failed on certain minor or major things. The wait is redicullous and its getting to the point where I cannot afford to h[keep paying out for the lessons, tests and everything else that goes with it. My son failed just by slightly speeding and now hes got to wait at least 5 months for a retake . Its an insult and im discusted that hes got to wait this long. I understand much of the delay has been caused by the government withdrawing the £200 payment given to Examiners to compensate them (together with normal costs) to leave their own areas and stay for a few days in areas with very long waiting lists, coupled with the fact that they are trying to make them do one extra test per day for the same money, but with only expenses paid if they are required to travel to other areas. On top of this some test centres had been closed altogether so the government has created this bottlekneck through costs cutting. The knock on effect is that driving instructors are going out of business as they cannot get their clients tested in good time. I am disgusted with the DVLA and their useless incompetence! I live in south lincolnshire and cannot get a test booked for Peterborough or Grantham or Boston! The DVLA apparently in their "wisdom" shut down the Spalding test centre. At the moment all you can do is pay your £62 for the DVLA to hold in the hope they can get you a booking eventually or they will refund you - eventually! This is a ridiculous and frustrating position to be in, but it's good to see that in a lot of areas of London the waiting time is 7-8 weeks. What are you going to do about this situation which has been going on now for at least the last 6 months - which is when I have had reason to try and book a driving test. So after a long waiting time my test day finally arrived. I have had time off taken extra lessons only to arrive at the test centre after a ten minute wait an examiner came out to tell me my test was cancelled. I work at a Gp practice image if we acted like this!!!! back in the summer Exmainers went out of their way to bring the waiting list down by working Saturdays Sunday's and even bank holidays but this is time away from their family's so they must be rewarded fairly for this lets hope the government gets on top of this now before it gets worse. When we are checked as instructors we have to adapt our lesson plan where needed to sort out an obvious problem to help our students.. we have to change it completley if we have to. If what the Dvsa have in place as a recrutment/process is not working then perhaps a change is needed here too. Because it is regarded as impossible which I found noy even fair when asking for feedback on unsucessful situational tests. How can you put right if you don't know where you have gone wrong? It seems the wait at Bury testing centre is now approaching FIVE months. Things actually appear to be getting worse, not better, in Manchester/Bury. Let me just say that again... FIVE MONTHS. When will we see an improvement? This is absolutely ridiculous. In this thread we have read about a myriad of reasons why waiting times are going up - from examiners retiring, more people taking up driving etc etc, and yes, im sure more needs to be done to get examiners recruited - and then retain them. But is this problem solely down to numbers of examiners? What about the wider industry? Could the learner driver training industry be creating, or at least contributing, to these problems itself? Lets take the question down a slightly different path and take a look at pass rates. Humour me if you will. On the Gov.UK website back in November it was quoted that just 21% of test candidates pass first time. 21%!! Put another way, 4 in 5 first time candidates FAIL. That, by any industry standard is embarassing. 21% is pitiful. Clearly something isn't right somewhere. Driving examiners themselves aren't responsible for those figures. They just mark what they see - over and over again it seems. In other walks of life most employees who ended a year having achieved just 21% of their objectives would be fired. Would you continue to employ and pay someone who only did a 5th of what they were contracted to do? Maybe you would. Similarly, looking at the overall pass rates for test centres, my 2 local centres fall into the "average" category, with pass rates of 46% - 48%. Bear in mind though, this figure comprises people who have taken their tests for the 1st, 2nd, 3rd....10th time. If 4 out of 5 people who take their test for the first time fail, what does that say about the quality of the candidates being presented? We've all heard all the excuses for failing - bad tummy, couldn't sleep, nerves, raining on the day, got a horrible examiner etc etc, and yes im sure some do suffer from one or more of the above on test day - but 4 in 5? How about a different possibility? How about the possibility that too many candidates are being presented for tests who, quite simply, aren't ready or who, dare I say it, have been badly prepared? As contributory factors go, I really do believe this to be a problem, particularly when looking at some of the calls I get, and some of the people I have helped. Example. Someone who had professional lessons took and failed 6 driving tests. When they came to me, I wanted to find the root cause of their failure. Nerves? Technique? In the end I had to stop their assessment after just 5 minutes. Their car control skills and knowledge was barely what I would classify as just beyond beginner. So my question is how was that individual certified by a professional instructor as being ready to take a test - let alone six? I did eventually get them through the test but it was after basically starting from scratch. That is not an isolated incident. Isn't that worrying? So, bringing the piece full circle, even if the 21% first time pass rate was dragged out of the swamp and raised to just 60%, it doesn't take a genius to work out the cumulative effect that would have on the repeat test figures. Less repeat tests means less demand on the booking system, which in turn means more availability. No rocket science there. To achieve those higher percentages, isn't part of the answer to significantly raise standards within the industry itself - from the qualifying process through to the Standards Check and beyond? Maybe introduce mandatory Professional Development for driving instructors? The first telephone was 2 tin cans and a piece of string. That was fine way back when but we wouldnt accept that now would we? Of course not. Skills and technologies develop and move on in all walks of life, so isn't it part of any professional instructors job to keep their skills current and relevant? Shouldn't it be an industry goal to attract the right people, train them well and maintain and monitor their skills throughout their career. At present, is the 5 yearly 1 hour Standards Check fit for purpose? That equates to 12 minutes of professional assessment a year. 12 minutes. How would the public themselves feel knowing that we, as paid professionals, are scrutinized for just 1 hour every 5 years? Whatever your own thoughts are, this problem isn't just about driving examiner numbers, and I think that first time pass rate figure of 21% is proof positive that the wider industry can do much more to help itself. The thing is though it's a vicious circle. You have a student who knows they're not ready, but they also know if they cancel they will have to wait another three months for another test and having to keep paying for more lessons. So they go to test anyway in the hope they just might get lucky. Little do they know they are just adding to the problem by taking up a test space that could be used by someone who is ready, and then again and again until they pass. I can't really blame them though. There is no date available to book practical test in Bletchley.! If I can't find the date soon and if theory pass certificate expires there no option but to drive with out licence. Daniel. You have had your Theory Certificate for 2 years it seems and you have left it until the last minute to get a driving test booked. 2 years is a very long time to get your act together. Unless there are reasons other than poor planning that has led you to leaving it so late, no sympathy here im afraid. Sorry. Also, are you saying is that if you cant get a test booked, which you have no guarantee of passing anyway - a 21% chance of passing first time, then you are prepared to drive on your own on a Provisional Licence. If that is the case, I hope the police are around to catch you. If that isn't what you meant to say, perhaps choose your words more carefully. As a parting thought why not invest in one of the various pieces of software that alerts you to short notice cancellations? Why not look for a cancellation or invest in software which alerts you when cancellations appear on the system? Im surprised your son's instructor hasn't already discussed these options with you. With regards to lessons, my one comment is this. Any practice is worthwhile. Remember that driving in your own is a different ballgame to taking lessons. In one environment you have the safety net of the instructor to identify any danger scenarios you have missed, but out there in your own it's just you and the car. If you miss something, you deal with the consequences. There is ALWAYS something to be gained from a lesson. Nobody, particularly a learner with comparatively few hours of driving experience, can know all there is to know . You can drive the same road 10 times and it is different every time. Unfortunately, many people are driven by the cost of lessons and not the benefits. Thorough training can mean the difference between spotting a situation and avoiding it, against not spotting it and ending up in trouble. What is the cost of the latter situation? Probably more than some good quality driving lessons. Just a thought. Whatever you are claiming to be doing you are not doing it fast enough. This blog is 6 months old, I still cannot book a driving test in my area or surrounding areas. The closest I can get from Peterhead is 50 miles away in an area I dont know and not until June. This is a shambolic situation to be in, one your department should be thoroughly ashamed of. There are no tests available in Peterhead or Fraserburgh and June is the earliest for Aberdeen. Unless I am willing to pay a company £20 to try and source a cancellation for me or take my test in an unfamiliar area I will not be able to drive for the foreseeable future. Considering I live in a remote area this has serious impact on my working life and home life. All because you cant get enough tester. I have just booked a test after failing first time and now have to wait till the end of April to resit it. So frustrating and now more money being spent on lessons. It would appear that they are closing Slough test centre!?!? Where are the thousands of candidates expected to go? This is grossly unfair - students will have to find even more money to pay for longer lessons to go further afield and instructors are faced with putting even more mileage on their cars = more expense! Not to mention how un-Eco-friendly it makes it!! Is there any update on Slough Test Centre? It's only just over a month until the apparent closure and it would be helpful to have an idea what's going on so that I can work out how best to help my customers. In response to a number of recent comments to this blog, we’ve seen demand for driving tests has continued to rise in 2016 and we acknowledge that waiting times remain higher than we would like in a number of areas. The recruitment and training of new examiners is an ongoing process and we’re continuing to offer posts to successful candidates on the merit list to places where examiners are needed. We usually run 2 large examiner recruitment campaigns per year, with additional campaigns as necessary (ie. where there has been insufficient take-up or success in geographical areas). I can confirm that our next recruitment exercise is scheduled to open for applications by the end of March 2016. Alongside recruiting new car test examiners, we’re increasing the number of motorcycle and LGV skilled examiners in areas where demand for these test types has risen, by carrying out an ongoing programme of internal training. Test waiting times in my area for one test centre alone have gone from 9 weeks before Xmas to 17 weeks now. In another, 10 weeks before Xmas to 14 weeks now. This blog has been going for some months now with no noticable improvement - in fact there has been a marked deterioration in the situation. The numbers of examiners being recruited appears to be woefully inadequate based on demand for tests. What's the answer? Telll people not to bother learning to drive? I took my first test on the 11/03/16 failed that one in norwich after doing the 5 day intense course. There are no dates in norwich available lucky i live near bury st edmunds and got a spot end of April 🙂 Then i check daily and through cancellations ive managed to move it to the start of april so i have only had to wait 4/5 weeks. If you keep checking it is possible to move it forward but you have to be on the ball! The spots dont last long at all and are scooped up as quick as they come! My son has failed his test today (Norris Green, Liverpool) and now has another 12-13 week wait before he can re-take. This problem with extended waiting times has been going on since 2014! 16 weeks waiting list for Irvine - next nearest 10 weeks - not quite the 6 weeks tageted for the stat of this year - what progress (if any) has been made/? my first driving instructor was very intimidating, the pressure on me to pass was immense already, I need to drive for my new job, then waited another long period of time for retest, had this this morning, made one mistake and now have to wait till July 6th to retake. It looks like we only have one examiner a day for a major city, shocking. I have probably lost my chance of the job as well, which isn't great when jobs are not easy to come by, and then the additional cost on top. It didn't help that when I was driving to test with my instructor, a driver pulled out straight in front of me, on one of the busiest roundabouts. I suppose there will always be an excuse for long wait times, it looks like last two years there as been an issue and it doesn't improve. DVLA please consider the impact your service has on people. I don't blame the examiners, I think the management is at fault.. I am very shocked to see how poor this system has been managed here. I come from China, a country with a huge population. The government is much more efficient and my friends who are taking driving tests there have a relatively better experience. Unfortunately I am here and will probably be here for another few years so I need this license. Otherwise I will just wait for the completion of my stay here and go back to do the test. I had very high expectations about the British system and the democratic governance. It is a shame to see that it does not work actually. My son failed his test at the end of March and another date was arranged for this week - just got an email to say it's been cancelled as 'examiner unavailable'. Nothing available until mid August. My daughter failed her test today at cobridge test centre Stoke on Trent - she tried to book a resit but it kept coming up no dates available. I rang the test centre only to be told that they arent taking any bookings at present. They have had two staff retire and two off at the moment undergoing surgery. I'm sorry but surely they were aware of staff retiring so why weren't provisions made? I feel really annoyed - she passed her theory test in August that requires she has to take again if she doesn't pass her test within two years, yet at present she can't even get book a test. Trent and I feel that I and many other people are paying in good faith for driving tuition and then cannot book a test. Something needs to be sorted with regards to this and quickly. So then DVSA, What has happened to your plan to reduce waiting times ??? I booked my driving test and the earliest date about 18 weeks ahead and now find out that the centre (Beeston, Nottingham) is actually going to be closing down soon afterwards. These waiting times are already a joke and it's only going to get worse in my area. I really can't afford to fork out the hundreds of pounds for regular lessons until closer to the time but in the unlikey circumstance I can get a cancellation I will probably have to go in unprepared. This is frankly an utter disgrace and the DVSA are clearly not too keen on fixing the problem. Perhaps they have a secret agreement with all these online "test cancellation check" companies since clearly the huge waiting times are propping these business up! Please do something about this soon. The theory test is valid for 2 years, right? As we are having such bad luck booking a test, and I have tried from today's date up to February next year, that's 8 months of theory used due to lack of action..... I think it only fair due to what's happening in the test centres, to extend that time frame... This is just diabolical! My pupils are having to face ever longer waits for a test. Guildford centre has a 20 week wait and other centres in the area are at best more than double the stated 6 week standard. I don't want to have to tell pupils to take their theory as soon as possible so they can book a test 4 months ahead, without a clear idea of whether they will be ready by then. It is a frustrating time and money wasting situation. Pupils facing a long wait will, not unreasonably, reduce or stop taking lessons until test time. They may by then have lost skills and knowledge, need to pay for more lessons to refresh their performance or risk failing. This situation must have been preventable, the birth rate rose 17 years ago, schools have been adding classes to accommodate them. Ageing examiners are foreseeable. Recognising that over the last few years people have postponed learning to drive must have been noted. Test fees should cover the cost of the service so money should not be an issue in its solution. My daughter passed her theory test today and tried to book Guildford and it is showing no dates at all, we even tried into next year! This is farcical and an absolute joke. I also agree with the comments further up the theory test is only validate for 2 year and if you have to wait 5 months for a test is means you get a maximum of 4 tests before it expires, until they have got this down to the 6 weeks they need to remove this limitation. Put it this way a baby takes 40 weeks! This isn't rocket science, get it sorted DSA, stop making excuses and fleecing the public of their hard earned earning. My son had his 3rd test booked for Thornbury (Bradford) for beginning of June (failed 2 previously), has been 'learning since January 2015 - no he is not a slow learner, instructors car breaks down time and again so has had approx 30 lessons in all this time. So the afternoon before his latest test date, his instructor's car broke down again, couldn't get another car from the whole of the driving school (not a small school/franchise either). So his test had to be cancelled, soonest re-book he could get is end of August. He asked at work for a day's holiday for the resit as soon as he got the date. Now they have told him he can't have the day off or even the couple of hours off (the test centre is practically next door) and he works for a well known banking group. He keeps checking the Gov website for cancellations around Yorkshire and is just getting next available dates as Late September and October, if his employer won't let him take the time for the test he is going to have to rebook again. This whole thing is not good enough for the learners at all, my son will have been 'learning' to drive for what will appear to be practically 2 years by the time he gets his licence. He was encouraged to get his theory passed way back last year, but its looking like even that might have to be retaken at this rate. You need to get something sorted for all of these learners and get it sorted soon. I took my test in the 1980s and my daughter is attempting hers now. The process is nothing short of a 'racket' with failure rates kept deliberately high to keep a steady flow of ill gotten gains coming their way. On top of the spurious reasons to fail learners drivers, tests need to be booked up months in advance. If the DSA is unable to book a test within a couple of weeks and the driving instructors tuition is universally so poor as to consistantly have over a 50% failure rate - the whole process should be taken off them and passed over to somebody who can equip learners drivers to pass their test and with an efficient booking system that gives a test date within a couple of weeks. Overhauling the process to accommodate the learner drivers instead of feed a money hungry racket would be a good place to start. So my son has just passed his theory and we have looked on line to now book test in Gillingham in Kent and what a surprise the waiting time is now 16 WEEKS, this is disgusting who ever is in charge deserves to be sacked a truly terrible service and what happens after 16 weeks if he fails do we have to wait another 16 weeks a combined total of nearly 8 months. This can not be correct this needs sorting out as a priority. I think you're describing a problem so many learners are facing. Feeling they need more time to prepare folk often end up taking their test anyway as no alternative suitable dates are available. I myself just failed my first practical test and have to wait until the end of October to retake due to waiting times. I'm keeping my eyes open for cancellations but don't expect to be that lucky. The dates available now in my area are November, who would cancel now to have their test in November?